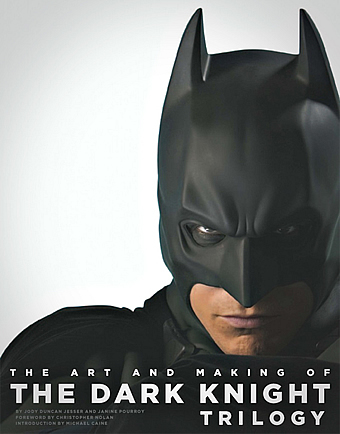 BOOK REVIEW #7: "THE ART AND MAKING OF THE DARK KNIGHT TRILOGY"
“The Art and Making of the Dark Knight Trilogy” was released as a companion piece prior to the final instalment of The Dark Knight Rises which was released in theatres last summer. Truth to be told, the book by Jody Duncan Jesser and Janine Pourroy covers materials previously mentioned in the DVD features of “Batman Begins” and The Dark Knight. And that includes the recent release of The Dark Knight Rises as well. That’s practically the reason why I waited six months after the publication of this book before I reviewed it simply because I wanted to give readers a better picture of this 304 hardcover book. Still, the material here is pretty astounding if you don’t mind the fact that it’s more Making of than Art. And personally, I much prefers Making of consider Director Christopher Nolan is not a filmmaker who reveals a lot of snippets in interviews or release any behind-the-scenes documentaries on the internet. The book is divided into three major sections: Pre-Production, Production and Post-Production. Readers get to learnt how Nolan and writer David S Goyer conceived the story of Batman in the former’s garage while production designer Nathan Crowley pulled bits and pieces from model kits to assemble their version of the Batmobile aka the Tumbler. There are pictures of that included so you get to see the prototypes in your own eyes. Next is a brief segment on the casting and of course, Christian Bale receives the most coverage while Costumes & Makeup looks extensively at the creation of the Batsuit, the ridiculous Bane mask and other characters’ costumes. It gets more interesting as we go into Production where location-shooting, stunts and special effects for the three movies are uncovered. I particularly loved the massive set they built for “Batman Begins”. Remember the Narrows sequence which Batman confront Scarecrow? The detailed street lights, neon signs, and buildings are painstakingly created in an indoor hangar at Cardington and that’s amazing. Nolan has a penchant for doing practical stunts and we learnt that he is constantly challenging his crew to devise new ways to shoot the various action sequences, be it the flipping of the semi-truck in the financial streets of Chicago, the bombing of an actual building or the Tumbler chase. Not to mention a live-size Batpod that flies through the streets in New York. In addition, there are also details on the fight choreography notably the painful fight between Batman and Bane and also touches on the difficulties and wondrous of shooting in IMAX. Lastly with Post-Production, Editor Lee Smith and music composers Hans Zimmer and James Newton Howard talks about the editing process and the experimental nature of scoring the trilogy. The last two segments talk about the creative process of blending miniatures effects, in-camera shots and visual effects to realise Nolan’s vision of Gotham and Batman for examples, digital bats, extensive landscaping and a digital Batman soaring over skyscrapers. Though text-heavy, “The Art and Making of the Dark Knight Trilogy” is worth every penny and dollar consider there are so many Art and Making of titles in the market that offers a lot less content and costs a gazillion dollars more. Get this if you are a Bat fan, it makes a great companion to your “Dark Knight” DVD/Blu-ray collection.